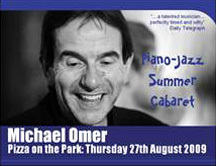 Following a musical career which spans Oscar Nominated drama, and producing for the charts, Michael Omer now shows the same wit, sense of fun, and unrivalled spontaneity in a welcome return appearance at ‘Pizza on the Park’ - jazz cabaret with edge. Relax and chill out on a summer’s evening to more surprising numbers from the “Unwritten, Unplugged & Unsigned” CD - in a mix of accessible jazz, and original songs, with something for everyone. Don’t miss it.